Embrace the power of Provocateur with the London-based luxury lingerie label. Agent Provocateur is renowned for their impeccable craftsmanship, fine fabrics and risk-taking approach to design. 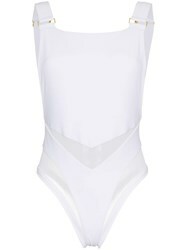 This white Hatty swimsuit from Agent Provocateur features a round neck, a sleeveless design, cut-out back details with clasp fastenings, a back tie fastening, mesh inserts and a lace-up front detail. 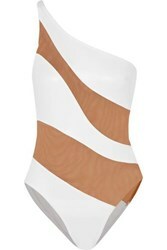 Swimwear must be tried on over your own garments.